This model is based on the concept that all of your inventory is in a SINGLE category within your store. 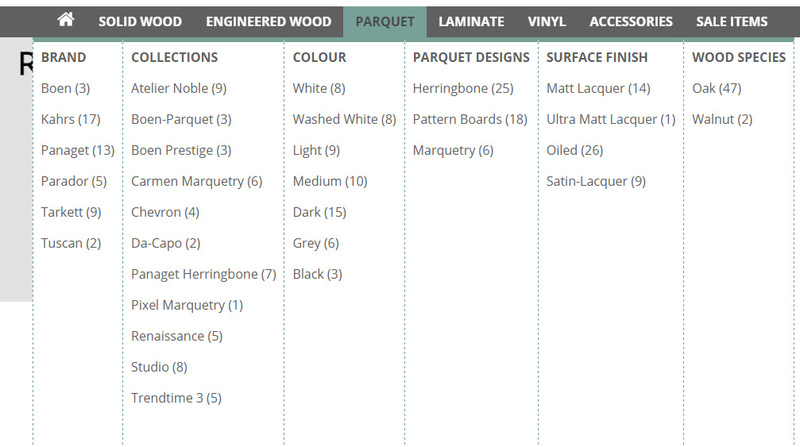 all of the inventory in one category is considered the haystack. Customers then apply filters to help them find the products of interest. in this case the products are the needles. This model works very well with the dynamic menu feature of the module. Menu items are essentially shortcuts to pre-selected filters which help the customer find the items of interest quicker. This model is based on a more traditional category filter system. 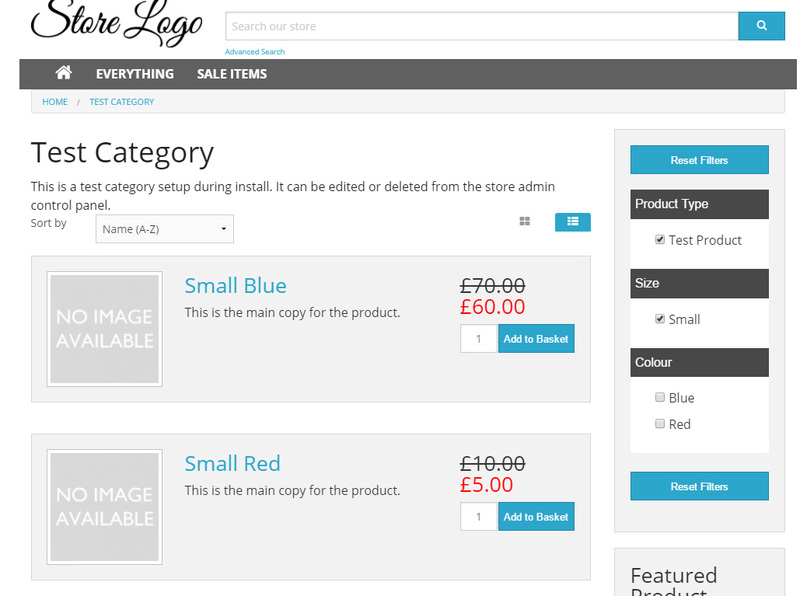 As a customer enters a category they are offered relevant filters based on the inventory in the category. 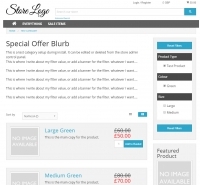 Selecting filters will show the customer only items they are interested in. Another way of looking at this model is that each category is a haystack, much like the needle and haystack model above. In this case you have multiple haystacks for customers to explore. This model does support the dynamic menu, but it works better with a traditional category based menu. This is optional depending on how you wish to use the module. The menu supports a maximum of two levels. Top level menu items are known as Filter Groups. 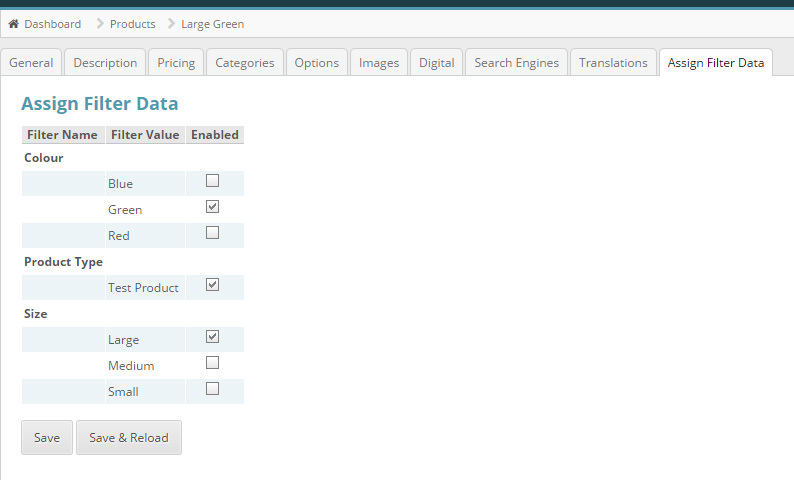 Top level filter groups can be linked with a filter value or simply used as a container for other menu items. Depending on the model you are using you can apply the filter group to either your category containing all of your inventory or to a variety of store categories. If you are not making use of the dynamic navigation menu it is recommended to disable the menu by checking the "Disable Dynamic Menu" checkbox in the module general settings. This will disable the calculation of the menu items in the background which offers a slight performance improvement. 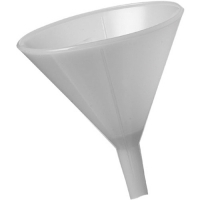 Both models support the use of price filters. 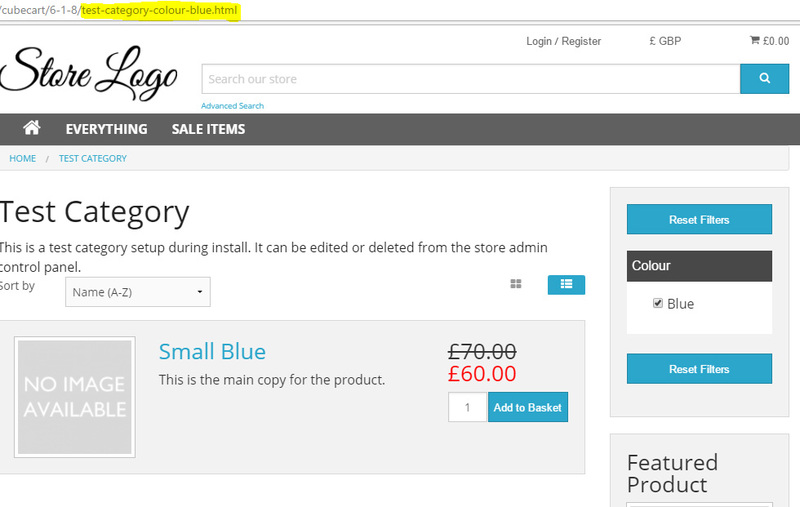 It is recommended to only setup a single price filter by checking the Price Filter box with the Filter Types tab. When a filter type is a price filter the inventory being filtered is evaluated and split into price ranges as configured in your filter values. A Price Filter requires Filter Values to be configured as numerical ranges. For example, "0 - 10" represents a price filter range of 0 to 10. Any products with its price in the range of 0 - 10 would fall into this filter value. 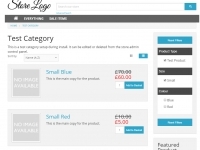 Price filters are not intended to be used in the dynamic menu. 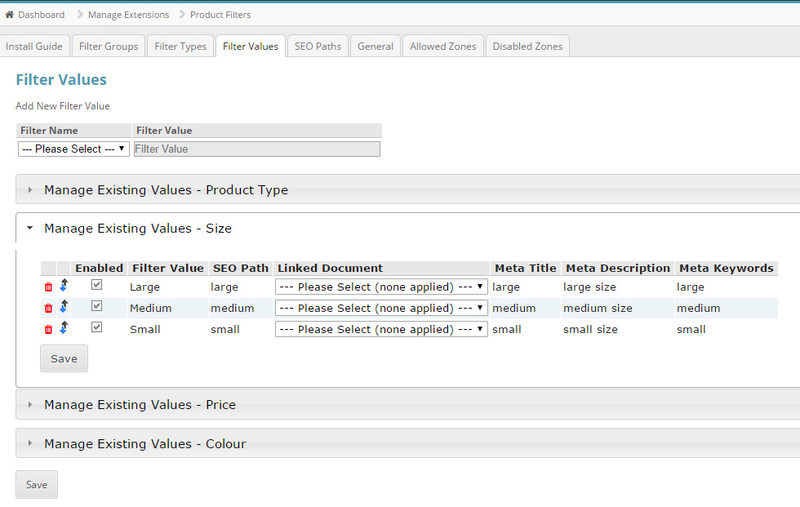 SEO links and data is dynamically built based on your Filters. SEO paths are dynamically built by joining together the SEO path of the parent category, Filter Types and Filter Values. 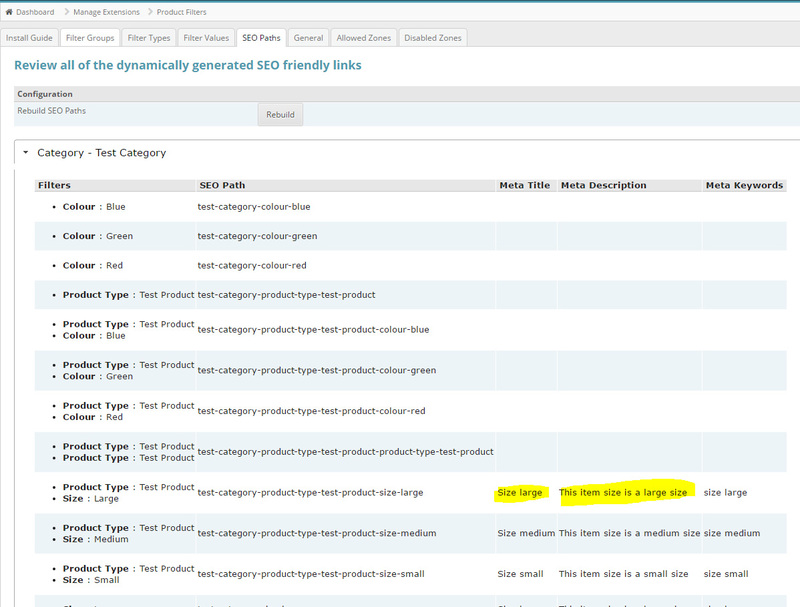 You can review generated SEO links within the SEO Paths tab on a per category basis. Generated SEO paths are added to your store sitemap. You can rebuild the paths at any time using the Rebuild button. 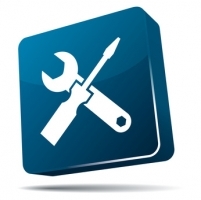 It is recommended to rebuild your SEO paths after making any changes to filters or inventory. As changes can be frequent the module includes a script which can be scheduled using CRON to rebuild your paths regularly. The cron file is found in the /modules/plugins/product_filters/cron directory and required no configuration to enable, simply setup the cron task on your server. It is recommended to rebuild paths during quiet periods on your store such as overnight. If no SEO path has been defined for a Filter Type or Filter Value when the rebuild process runs a default value will be generated. SEO titles, descriptions and keywords can be used if you wish. Much like the SEO Paths, titles, descriptions and keywords will merge with the parent category SEO data based on Filter Types and Filter Values. Should you not wish to use this feature you can leave the values as NULL and they will be skipped. 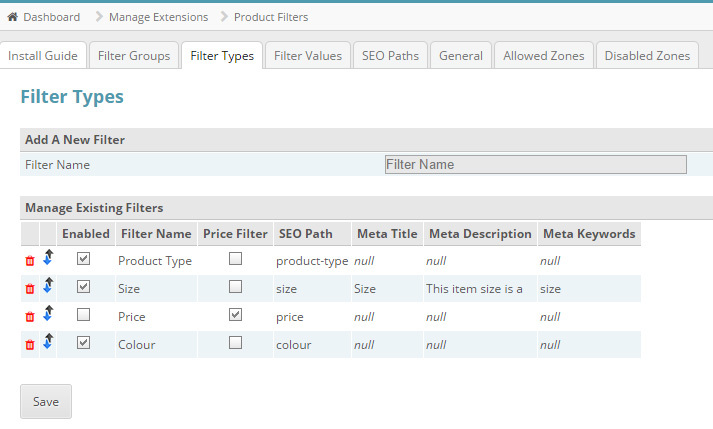 You can toggle on or off Filter Groups, Filter Types and Filter Values. A disabled filter condition will be excluded from the menu and filter options shown on the store front but keeps the association of the filter conditions with your store inventory. This can be a very useful feature if you are using the Needle & Haystack model or Category sub-filter model. 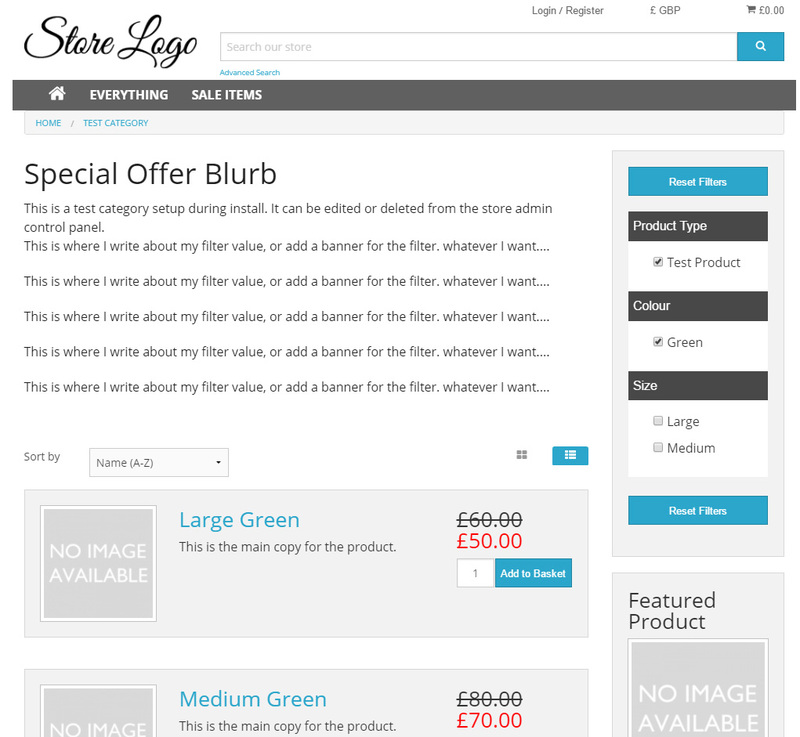 Any document within your store can be linked to a Filter Value. 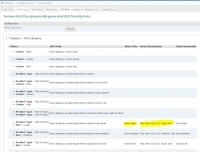 If a customer applies a filter condition which is linked to a document then the document content is displayed to the customer before the product list. An example of this would be if a customer chose a Filter Type of "Manufacturer" and Filter Value of "Microsoft" and the Filter Value is linked with a Microsoft document with promotional material. The promotional material specific to Microsoft is displayed before the product list.